Explanation: Io has its own cloud. Jupiter's most active moon is visible on the left of the above false-color photograph, with its left side illuminated by sunlight. But what is happening on Io's right side? Here a plume of gas from the active volcano Prometheus also reflects sunlight. A second active volcano, Pele, is also visible: marked by the red spot just below Io's center. Surrounding the moon is a yellow haze originating from gas ejected by Io's volcanos. 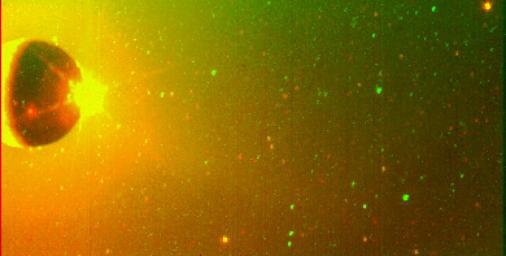 Sodium atoms in the gas cloud are particulary efficient at reflecting yellow light. Several points of light are background stars.